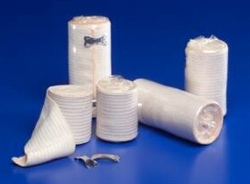 Curity™ Elastic Bandages are non-sterile, individually wrapped rolls with removable clips. These rubber blend bandages are highly conformable to provide compression and support. Detachable clips provide convenient and exact positioning and the 5 yard stretch provides optimal coverage.